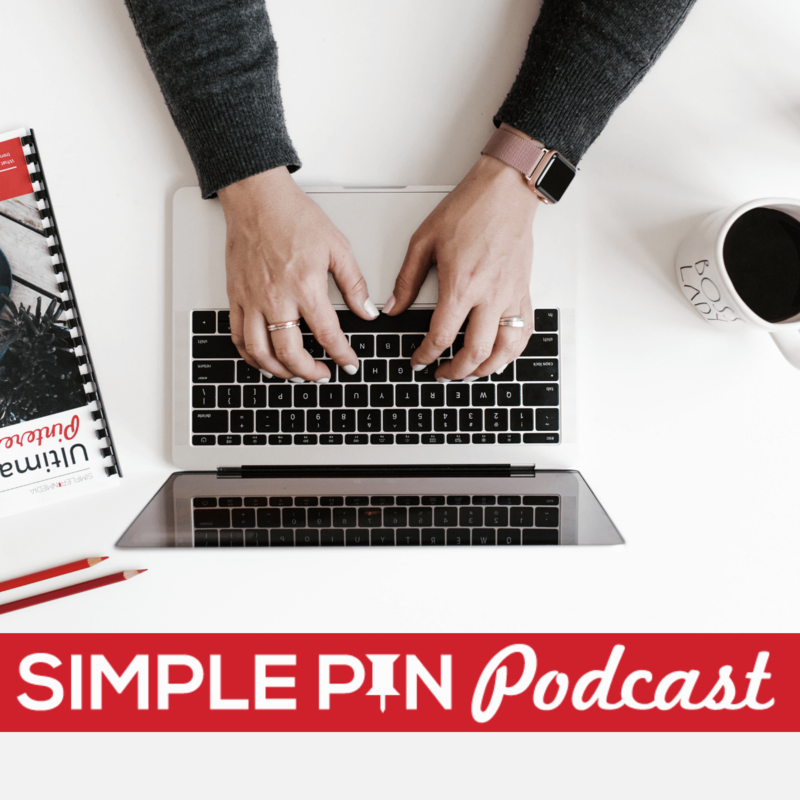 Kim Herrington joined me on the Simple Pin podcast. Kim is an SEO and Analytics expert, and founder and owner of Orsanna, a digital marketing agency. Kim teaches digital entrepreneurs how to get found online, how to better serve their audiences, and make money through their websites through savvy marketing strategies. Kim shares SEO and Analytics tips on her blog and in her weekly SEO newsletter. This episode is so full of helpful information that I know you are going to want to listen again and again. There is just no way to take in all of Kim’s information in one listen!! So then, what should our SEO strategy for Pinterest look like? Know your searcher’s intent. People search Pinterest for discovery, aspiration, and transformation. They look at Pins and they make plans for change. (This differs from Google, where folks are looking for answers to specific questions.) You want to draw people to your content for discovery, but then give them action steps to take. Begin by brainstorming things that you will be addressing in your content; answer questions, teach a skill, provide a recipe, etc. Address the issues that people are searching for. Focus on your images. While Google focuses on text, Pinterest focuses on text along with visual cues in their search engine. Pinterest decides which Pins to show you based on visual relevance to your search terms. These visual analysis tools come into play not only in Pinterest searches but also in the new Smart Feed. Images are of the utmost importance in your overall Pinterest strategy. Isolate your keywords. This is not a contradiction of the previous point. While Pinterest does focus on visual cues, using keywords in your Pins, Pin descriptions, board descriptions, and the original text is still highly important. The importance of keywords can’t be overstated. Google will use these keywords to drive traffic to your Pins. As a matter of fact, Google has its own tool to assist you in choosing keywords to use. Google Keyword Planner Tool is a tool, that while originally developed for advertisers, can be very helpful in knowing which keywords are ranking higher in searches. This will allow you to choose the top most searched keywords and include them in your text. There are some cautions to keep in mind when working with Keyword Planner: it is not particularly user-friendly for bloggers, and you need to be sure to cancel your ads before you are charged for them. They will ask for credit card information when you sign up. You can cancel them by going into your account settings in the upper right corner and canceling them. When using the Google Keyword Planner Tool, be sure to use some variance as you are searching keywords. For instance, don’t just search “dog bed”, but also “bed for dogs”. So now you have figured out a couple of keywords…what next? Learn more about how to keyword on Pinterest following the step-by-step tutorial here. You’ve found your keywords, and you are trying to use them in all the ways listed above…but how can you be consistent with keyword usage in order to rank higher in Pinterest searches? If you want your boards to stand out from the crowd, you need to give them titles that will make them do just that. Find a way to use your keywords in a unique way, while still making complete sense. Because Pinterest tends to show up so well in Google’s own search engine, use those Board descriptions to get more keyword usage. Write an engaging Board description, using keywords strategically throughout, but not overusing them. Write naturally, knowing you can always edit it later if you aren’t pleased with it. By using your keywords of “chicken”, “dinner”, and “one pan dinners” in your Board description, the reader knows exactly what the Board will contain. *Keep in mind that in order to use Rich Pins, you must have a Pinterest Business account. If you haven’t converted your account to a business account, you need to do so right now! Here’s the best way to play to both Google and Pinterest in regards to SEO. Are longtail keywords better than shorttail ones? What is an example of a great Pin description? Why do random Pins show up #1 in Google searches sometimes? To wrap up, Kim shared what I like to call a “gold nugget”…a piece of information that will have immediate effects on your business. What are your tips for SEO and Pinterest? Interested in more Pinterest information? You can listen to all of the Simple Pin Podcasts here. There is a small box that says ‘alt text’ when you upload an image. That’s where you should enter the information. I’m so encouraged that you found it helpful! Thanks for listening. In the podcast, Kim talks about the tags other than the alt tags. I know you said you’re looking into it. Any updates? For now I would stick with alt tags. Pinterest still reads it so you’re good. But I’m going to talk with Tailwind today about it. Thank you! Any info would be great! After doing some digging I’m not sure it’s worth the work. Alt text descriptions still need to be filled in based on habits of pinners. They pin what they want based on how it all looks, even if it’s not your best image. I’ve used the alt tag for the Pinterest description for years! I know Google isn’t penalizing me for this practice, and I don’t think Pinterest is either. Will keep on keepin’ on! Overall a fantastic podcast, and thanks so much for providing text as well! I get really distracted with audio and video. Love to reinforce with the text! This was such an awesome podcast! It helped me understand so much. Kate, you asked such great questions! Thanks for starting this podcast. I am just starting to look at Pinterest with regard to my blog and posts like this are really helpful, thank you. Apart from anything else I love to look at Pinterest! Gotta love Pinterest for everything they’re about. I didn’t know Pinterest is so valuable for SEO. So thank you for discovering a lot of things for me. So it’s important to implement keyword research skills too. You also mentioned Keyword Planner. I would add that this is really the nice tool, but it’s not enough to get a wide list of keywords. To fix this problem I started to use https://kparser.com/alternative-google-keyword-planner/ Especially, it helps me to find valuable low competitive words for my website. Hello Kate, thank for podcast. I love your approach to unpacking the mysteries of Pinterest. And how exactly it operates. I am a newbie to Pinterest but majority of our couple use it. And I want to get in front of my audience and eventually convert them to book us. I want to use Pinteres to promote our business and capture couples at the planning phase of the wedding or elopement. We are Roaring Twenties Vintage Wedding Car Hire – a vintage car business based in Brisbane Australia. We are both wedding creative’s and have particated in numerous real and styled wedding shoots. Over the past 2 years we have seen FEATURED in several online wedding blogs and I want to really showcase their to our South East Queensland audience. 1. I am really keen to read the article mentioned in this podcast which talks about how to determine your top priority keyword search terms but I can’t see it listed in the podcast notes. I am digest this podcast and then will move on to listen your playlist. Please could you tag me in.